They recently changed the bottle of the brand of blue shampoo I usually use, but I didn’t pay much attention until today, when I happened to read the bottle in the shower. 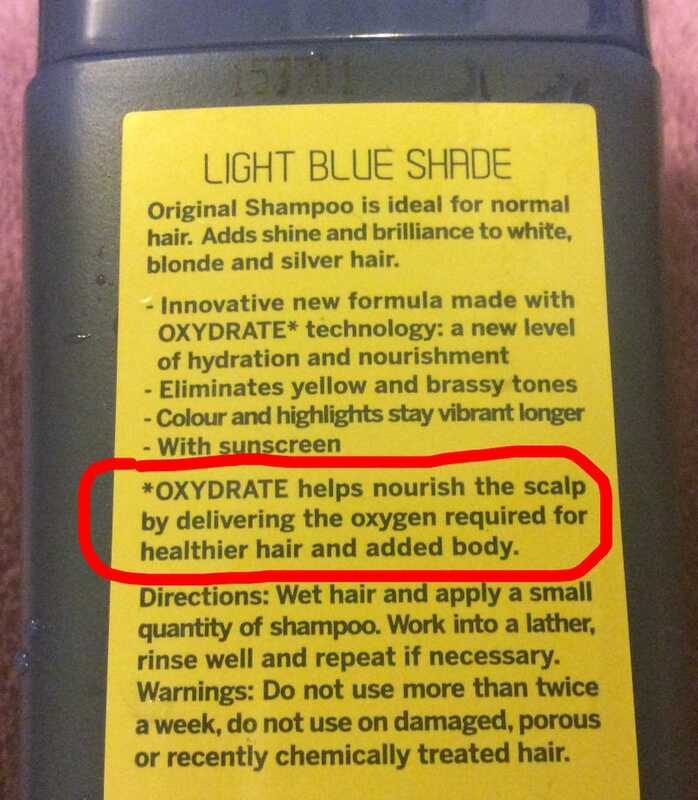 So apparently the company is now claiming that their shampoo will help “nourish the scalp by delivering the oxygen required for healthier hair”. First off, how exactly is a shampoo going to deliver to my scalp? I am not a chemist, but I would think the shampoo would need to produce oxygen when mixed with water. I am under the impression that any reaction that would do so is probably a bit more violent than I would want happening in my hair and on my scalp on a regular basis. Also, even if it was generating oxygen in a safe manner, it would be delivering it to the dead cells of my epidermis. Getting enough oxygen to penetrate down to my dermis to do anything that normal blood flow won’t seems unlikely. Feels like this is a modern version of the Victorian myth that skin needs to breathe. Oh, and here is the ingredient list for anyone who is curious.